The Palestinian Authority's electoral commission has said January's presidential and parliamentary election should be postponed. It said the vote scheduled for 24 January could not be held because Hamas had banned elections in Gaza and Israeli co-operation was not confirmed. PA President Mahmoud Abbas must now decide whether to accept the advice. 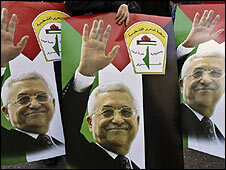 Mr Abbas has said he will not stand for re-election because of the impasse in peace negotiations. However, he is set to stay in office until polls are held. "It has become clear to us that conducting elections in the Gaza Strip is not likely to happen," Hanna Nasser, chief of the Central Elections Commission, told reporters. Mr Abbas called the elections for 24 January last month after his Fatah faction and its Hamas rivals failed to reach a reconciliation agreement paving the way for fresh polls. Hamas, which forced Fatah loyalists from the Gaza Strip in June 2007, said it would not allow any activity related to the elections to take place in Gaza. Hamas won in legislative elections in 2006, but the four year term of the Palestinian Legislative Council, or parliament, is due to expire in January 2010. Mr Abbas' presidential term expired earlier this year, but he has argued that the Palestinian basic law allowed him to stay on as it called for parliamentary and presidential elections to be held simultaneously. He has struggled to make headway towards a peace deal in negotiations with Israel, amid deadlock over Israeli settlements, and announced last Thursday that he would not seek re-election. Many in the region saw his announcement as a tactic aimed at pressuring Israel and the US, but Mr Abbas's aides say he is serious.